The NEW iPhone 6 with back and sides embellished in either 24k Gold, Rose Gold or Platinum. The iPhone 6 is SIM free and factory unlocked to ALL networks – meaning you can use the iPhone 6 on any network worldwide. The love for luxury gadgets is increasing in people worldwide. Many companies are engaged in fulfilling the demand of luxury phones and they are doing a great job. The technological advancements have revolutionized the mobile market. One such gadget is iPhone6 from Apple. It is equipped with many extraordinary features. We have made the awesome phone more desirable with its luxurious customization. 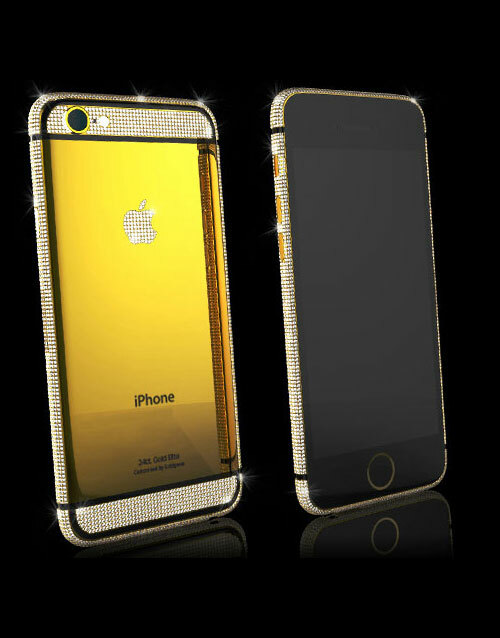 The back and sides of the iPhone 6 is embellished in either 24k Gold, Rose Gold or Platinum. The iPhone 6 is SIM free and factory unlocked to ALL networks – meaning you can use the iPhone 6 on any network worldwide. All Alchemist handsets come with lifetime plating guarantee. The iPhone6 was launched in September, 2014. It comes with a screen display of 4.70-inch with touch. The resolution is 750*1334 pixels at a PPI of 326 pixels per inch. It has 1GB of RAM. The phone carries 16GB of internal storage which cannot be expanded. Talking about the camera, the Apple iPhone 6 has a 8-megapixel primary camera on the rear and a 1.2-megapixel front shooter for the perfect selfies. The Apple iPhone 6 runs on iOS 8.0 and is powered by a 1810mAh battery which is non removable. It dimensions are 138.10 x 67.00 x 6.90 (height x width x thickness). It weighs 129.00 grams. It is a single SIM (GSM) smartphone that accepts a Nano-SIM. Connectivity options include Wi-Fi, GPS, Bluetooth, NFC, 3G and 4G (with support for Band 40 used by some LTE networks in India). The phone has sensors including Compass Magnetometer, Ambient light sensor, Proximity sensor, Accelerometer, Gyroscope and Barometer. The improved contrast ratio (the difference between the deepest blacks and the whitest whites) is really something to behold, and the colour reproduction is very impressive too. The screen of iPhone 6 screen is as good as it can at this size. The iPhone 6 is a big step forward on the iPhone 5S. The screen is more correct when it comes to colour reproduction, and as mentioned the contrast ratio (which is important for the more atmospheric movies) is improved, as I noticed in the original TechRadar tests. Millions of customers are happily unboxing their iPhone6. Better battery life, the bigger screens and fast operations and a lots more has been offered by this awesome gadget. You can read the mile long new cool features of this product on the official website of Apple. The amazing features of this phone will make your life more comfortable and exciting at the same time. None of these are going to flip the mobile market on its head, but taken as a whole, they’re definitely worth the price of this cool product. It’s completely automatic, so you don’t have to change a thing. You’ve been able to record 1080p video on smartphones for a while now, but Apple wants to push the limits with this release. The videos can be shooted with clear crisp quality. If you’re recording your kid’s soccer game, or shooting from a moving vehicle, this will make all the difference in the world. Even better, the slo-mo mode now supports upwards of 240 fps, so you can capture an insane amount of detail in your home movies. Over the years, Apple has continued to pack more sensors into its devices. For example, the ambient light sensor, proximity sensor, accelerometer, gyroscope, and TouchID sensorwere introduced in previous models. This time, Apple added a barometer into the mix. Now, apps can more accurately track your location and things happening around you. If citizen science is your bag, the addition of this sensor holds a lot of potential. Alchemist has customized this awesome gadget to become more luxurious. To avail this luxury item, click here: https://www.gold-alchemist.com/product/gold-iphone.